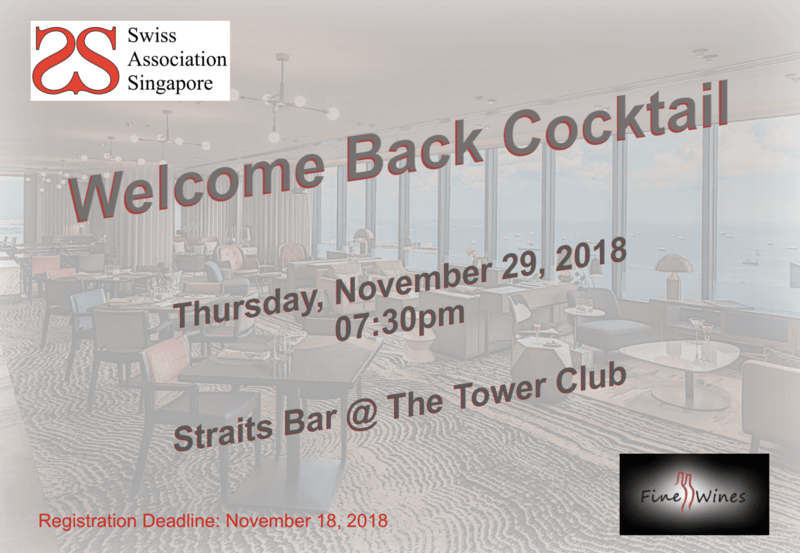 To thank you all for your continuous support and interest in the Swiss Association of Singapore, we are delighted to welcome you on our annual WELCOME BACK COCKTAIL on Thursday, November 29, 2018 from 07:30pm for a relaxing evening and catching up with friends. This year’s event will be held at Straits Bar @ The Tower Club, a newly renovated colonial-style bar giving it a bit of sparkle and glow. In the heart of Singapore’s Central Business District, the Tower Club, the city’s premier private business club, occupies the top three floors of the 280 meters high Republic Plaza from the 62nd to the 64th, where a world of prestige awaits with magnificent views of the city’s dynamic business hub and harbor.